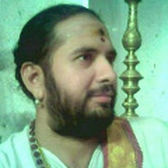 ShastriJi with Sant Sri.RameshBhai Oza on MahaShivaratri Day at Varanasi in Feb 2009. Shastriji with head of RSS Shri Mohanji Bhagawat in 2014. ShastriJi Receving Blessings of two H.H. Sri Shankaracharyas of Kamakoti Peetham at Kanchipooram in Feb.2009.